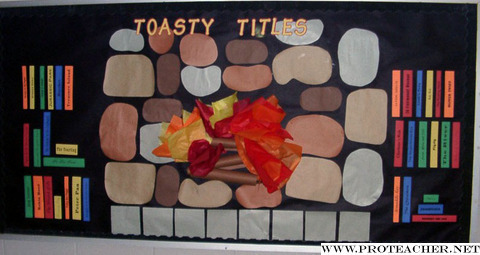 This winter bulletin board makes everyone long to curl up in front of a fireplace with a good book. I started with a black background and black border. The stone in the fireplace were cut randomly from different shades of brown and grey. The logs are rolled up pieces of brown paper, the fire is red, yellow and orange tissue paper. The hearth was made from rectangles of grey paper. To add a punch of color, book titles were printed, cut into strips and glued to look like a bookshelf. The board is simple, with unnecessary details like the bookshelf omitted but implied. Everyone will enjoy it thru the winter months, with an eye towards Spring.